The New York Times recently ran an article, Craft Beer’s Larger Aspirations Cause a Stir, that left many in the craft-beer world scratching their heads. The beer bloggers I follow on my Twitter feed were abuzz after this piece. And, after reading it myself, I did my own head scratching. The article was full of glaring holes and, may I say, blatant misinformation that just didn’t sit right with me. Maybe it was the word wine-ification that burst a blood vessel. The comment section on the online article just wasn’t large enough for my thoughts, so I figured I better write them here. The article begins, “…[W]alk into a craft-beer store these days and you’ll see shelf after shelf taken over by giants: 22-ounce ‘bombers,’ 750-milliliter wine bottles, even three-liter jeroboams.” This may be true, but it’s just simple math, not a conspiracy. There are more breweries in the United States than ever—922 microbreweries breweries as of July 2012, up from 615 just 2 years ago, according to the Brewers Association. What was old is new again or never went away, we just weren’t paying attention. 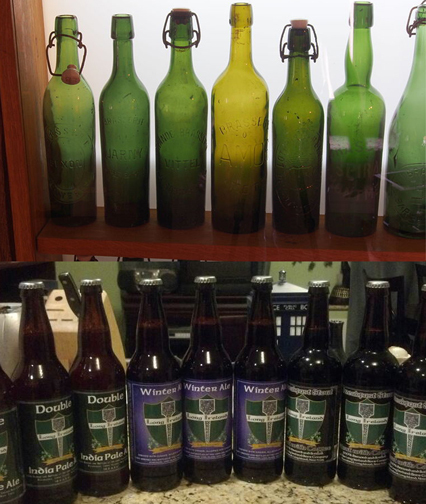 Top: Antique beer bottles from the Musée Européen de la Bière collection. Bottom: 22oz. bottles from the Long Ireland Beer Company. Microbreweries do not start out producing over 100,000 barrels a year that established brewers such as Dogfish Head will in 2013. They usually start out with a determined brewer, supportive family and friends, a single van, and a lot of upfront costs. Want to start your own brewery? After the costs associated with licenses, property, construction, and equipment you’re looking at being six figures in the hole without producing a drop of beer. The larger format bottles (750mL & 22oz.) options are more efficient from a small breweries perspective. The labor to apply a label—many times by hand—and cap a bottle—also by hand—is the same effort on a bottle holding 12oz. or 22oz. The only efficiency we gain is by selling a larger amount of product to offset the labor expense. To operate even a small-scale canning or bottling line is still labor intensive, and the equipment capital can range from $30,000 dollars into hundreds of thousands. This was our first-ever bottle release, and [it] evolved somewhat spontaneously due to the fact that our brewery was heavily damaged by [Hurricane Sandy], and we had limited options on how to rescue the beer from the tanks. We had no power for over three weeks, which meant no ability to clean kegs or transfer beer via pumps, so we decided it was an opportune time to make our first hand-bottled beer. Cans require a canning line, so they were never an option for us. We decided to go with 750mL bottles for a few strategic reasons. Hand-bottling is time-consuming, and smaller bottles mean more bottles and more bottling time, so a larger format greatly reduced our bottling time—we still had a brewery to rebuild and needed most of our time and labor for that! Also, bottles require caps and labels, and smaller-format bottles means more material costs—including the bottles themselves. Lastly, we saw this as a special beer, commemorating an historic event not just for ourselves but for the entire surrounding area, and we knew a number of people would hold onto the bottle itself as a keepsake. So we felt a larger, more elegant bottle was the appropriate choice. Very few microbrewies have the beginning capital or capacity for that large-scale beer production, because the costs are great. That isn’t to say some microbreweries can’t start with 12oz. bottling. 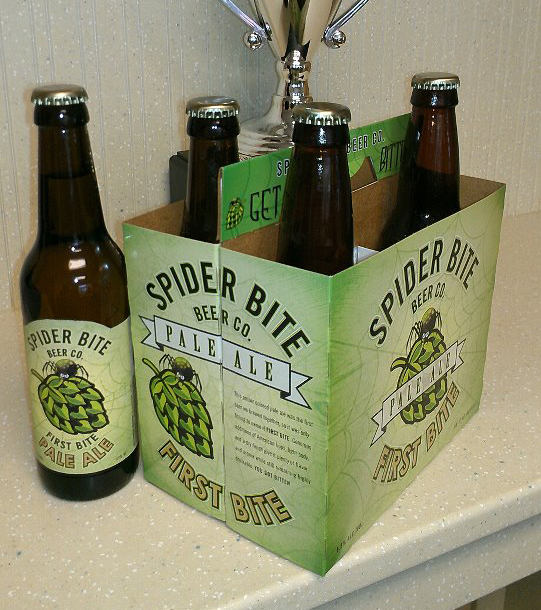 For Larry Goldstein, owner and brewer at Spider Bite Beer Company, it was more a consideration of the alcohol content. …[O]ur first beer was the pale ale. To me, this is a beer best served in 12oz. A six-pack gives a range of choices. For a 5.5% beer you can have one, two, three, etc., where in large format it is more like counting by twos. …So for Boris the Spider, we were going to go large format, but mainly because we wanted to use a larger label, and also because it costs us less for packaging, so [it’s] a better margin. But not everybody drinks a large 10% ABV bottle. It is great for sharing, though. …[So consumers] might just buy one bottle vs. a four- or six-pack. I personally prefer 12oz. now. [It was] the other way when I went to tastings. Yes, the upfront costs are a lot more for the six-pack. Cost wise, 750mL and 22oz. make sense, especially when it comes the beer distributor. My local beer distributor sells beers from over one hundred different breweries across the U.S. and some from Belgium, France and Germany. If these beers were all sold as six-packs the distributor would not be able to keep this many breweries in stock. Physically, he just would not have the room. Facing the facts, macrobreweries are still king. InBev, Miller-Coors, Heineken, and Modelo rule the shelves. Any space left over goes to the largest craft beer producers, Samuel Adams, Sierra Nevada, Brooklyn Brewery. What room is left for the microbreweries? Distributors love the larger bottles, which give customers what they want and what they demand: A wide-range of brews of different styles and origins, without taking up that much space. They do sell at a higher price margin, but how much higher? The New York Times article states, “Bottles sell for as much as $30 in stores,” and “Internet message boards dedicated to craft beer are replete with complaints that large bottles are too expensive” Sure, there are stores in New York City that sell 750mL bottles of aged brew for $30, but 90% of the stock at my local distributor on Long Island was under $20. About half of the 22oz. and 750mL went for $16 or less. I just picked up a Southern Tier Choklat for $9.95. Where was Clay Risen, the author of the Times article, shopping? Starfish makes my “bomber” pretty. Continuing with the Times article, “…and, thanks to their typically higher alcohol content, [750mL bottles are] a challenge to finish in one sitting. Unlike wine, a beer is nearly impossible to recork.” First, what is considered a high alcohol content? A reasonable rule of thumb is over 10% alcohol by volume (ABV). On the shelves of my local distributor, nearly half the bottles are under 8% ABV. There are 12% ABV tripels, along with 5% or 6% ABV biers de Mars or saisons. And, why do we have to finish a bottle in one sitting? 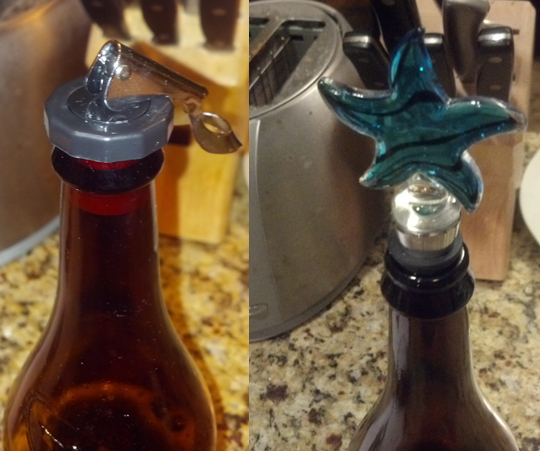 A good wine cork gets two or three days out of an open beer bottle, about the same time as an opened growler and average for a recorked bottle of wine. How do I know? I’m drinking a Birra Etrusca by Dogfish Head while writing this. Today is Sunday, and I first opened it on Friday. Does it taste exactly the same as I first opened it on Friday? Maybe not, but does a glass a wine? Many brewers are heavily involved in their communities and want to use local ingredients to support local businesses. That often includes using oak barrels from their local wineries, whiskey barrels from their local distiller, and fresh farm ingredients. How can they produce enough these specialized beers on a larger scale without sacrificing quality? There aren’t enough Bourbon barrels in Kentucky. I could go on and on picking apart the Times article but they did get one thing right, these larger bottles are meant to be shared. Last year, craft-beer drinker, DnU contributor, and friend Scott S returned to Long Island from Colorado. We met up at a local restaurant, Bobbique, in Patchogue, which has many craft beers on tap and in bottles, but one caught Scott’s eye. He wanted to try a 750mL bottle of Brooklyn Brewery Black Ops—an imperial stout aged in Bourbon barrels, with 1less than 1000 cases produced. It cost $30.00. We split it between us, and it was amazing. The only complaints we hear are from people in restaurants and bars in New York City spending $15–20 for a simple cocktail or a glass of wine.